You obviously didn’t get the memo, that brass is best discarded. And what brand primer is that? I agree. I sure hate to trash any brass, but any and all A-merc goes straight into the scrap bucket. I am using CCI No. 300. 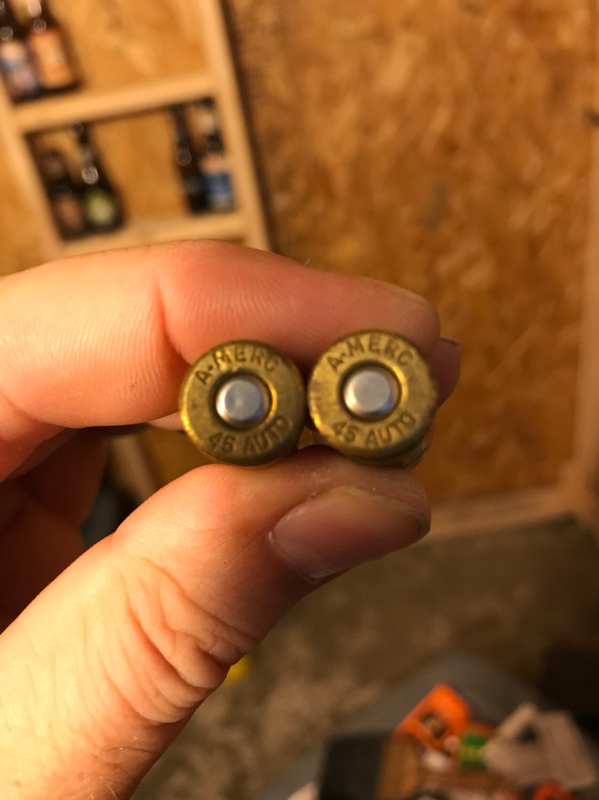 Yeah when I moved I found 3 boxes of those jokers from the ‘we thought we could never find bullets again if the feds ban them’ spree about 5 years ago. I've reloaded occasional A-Merc cases on my 550B press and never identified them as problematic. But like other strange and wonderful brands, I assign them to lots marked 'junk brass,' saved for plinking sessions in high grass. And they come in flavors other than .45 ACP, too! Never had any problem with those cases. The two rounds pictured, look like they weren't flared at the mouth enough, shaved lead, causing the issues. If you search AMERC, you'll find hundreds of posts complaining about them. 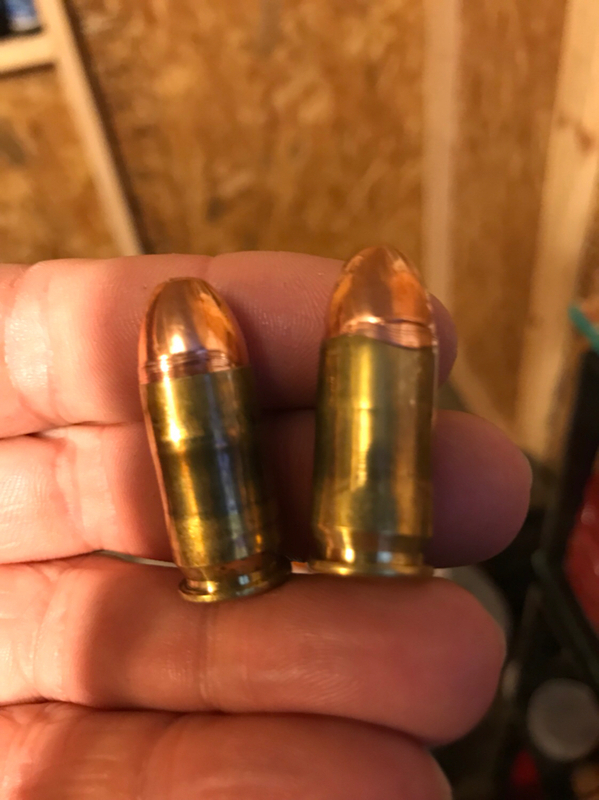 Years ago, when I first found some AMERC in a batch of range brass I bought (38 spl), I did attempt to load them, there was a High percentage of failure, usually the case would crush during seating or crimping. When I say high percentage, I am comparing it to the failure rate of other brands...So 1 in 10 (10%) is really high. But with that said, I could have successfully loaded the remaining 90% without issue...I just choose to reject them all and send the brass to the scrappers. I always sort all my brass by headstamp, so culling the AMERC (and other unfavorable brands) takes no extra work. Isnt Amerc made in the Phillipines? I have never gotten enough to load. I sort thru and try to use same brands for a box of loads. Its rare to find enough to make a box. On another link ... Brass with the headstamp AMERC is made by American Ammunition Inc in Miami, FL. It is the worst quality brass imaginable. The flash holes are often off-center, the case diameter is out of spec, and it often splits on the first or second firing. Not only do I not pick it up, when I find it I crush the case mouth with pliers to prevent some other reloader from experiencing the horror that is AMERC brass. I'm a brass scrounger and have been known to use questionable brass in the past, even steel and aluminum cases (though not anymore). That said, AMERC brass of any caliber goes straight into the scrap bucket. 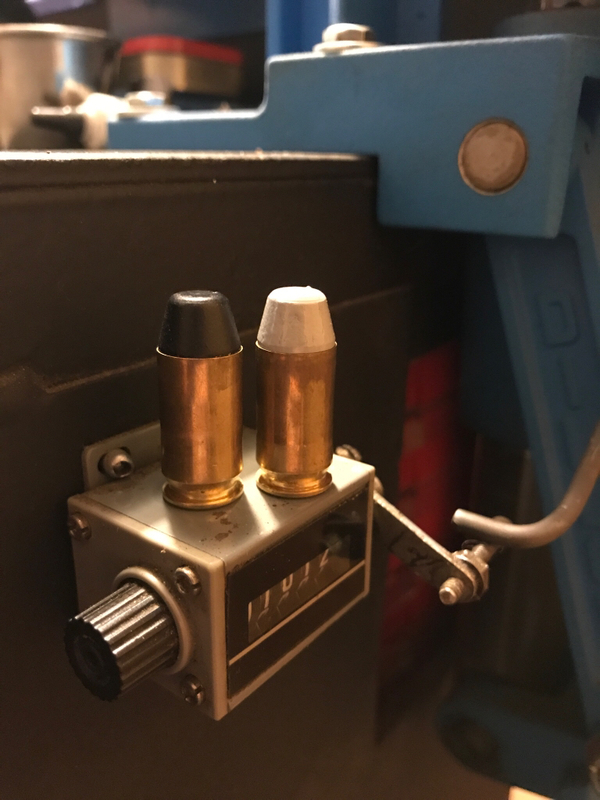 From past experience over decades of reloading, I've found that you can occasionally make it work, but it's never worth the hassle. It's total garbage. Do yourself a favor- if it says AMERC, scrap it. Thanks for the info. I haven't run into any A-Merc yet but I'll keep an eye out for it. I have had a few problems with some others. A USA is one of them that have had several with off center flash holes. I found an Aguila the same way yesterday. I have noticed CBC 9mm Luger has a tighter internal diameter, I get a very pronounced bullet bulge with them. I like it to, I have an old Dillon counter that I will put back in service now.. Thanks OP. I too have found that you can load the junk but it's not worth the hassel. Scrap yard!! !